You're paid up for the next installment of the Brick encyclopedia -- an almost regular and certainly non-comprehensive explanation of LEGO-related terms. G is for...gear. 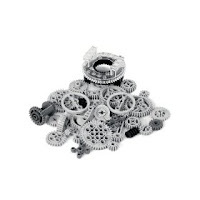 Gears are used in Technic sets to transfer power or movement -- the same as in automobiles or any piece of machinery with moving parts. G is for...Gold Tooth. You don't get many LEGO minifigs with grills, so this henchman of Dr. Inferno is pretty noticeable. He's also a pirate without an eye patch, which means he's probably got some great stories. G is for..Gary McIntire -- a master model builder at LEGOLAND California. In addition to building a massive LEGO ball for Mythbusters, Gary is an outstanding tour guide. G is for...Gail Storm. She's the heroine, who sadly often needs rescuing, from the Adventurers and Orient Expedition series. G is for Galidor. A LEGO-ized version of a television show about intergalatic explorers trying to save the title city. This was LEGO's unsuccessful foray into the world of action figures.